US President Donald Trump has called for the National Football League (NFL) to be stripped of tax advantages. In a tweet he complained the league had received "massive" tax breaks, while some of its players had been "disrespecting" the national anthem. The teams pay tax, but have often received public support to build stadiums. The NFL league office, which oversees rules, referees and the college draft, gave up its tax-exempt status in 2015. 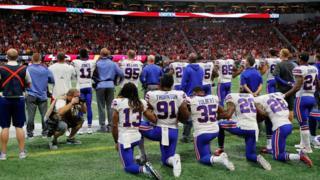 Dozens of players have been kneeling down during the pre-match national anthem, instead of standing, in anger at comments made by the president. Former San Francisco 49ers quarterback Colin Kaepernick started the protest last year when he sat down as the Star-Spangled Banner was played during a pre-season game in 2016. He explained his gesture, which later became known as "taking the knee", was meant to highlight racial injustice and police brutality against African Americans. Mr Trump has criticised players sharply for the protests and pressed the NFL to ban them. On Sunday, US Vice-President Mike Pence walked out of an NFL game between Indianapolis Colts and the San Francisco 49ers after several players refused to stand. Mr Pence said he could not be present at an event that "disrespects our soldiers, our flag" after abandoning the game in his home state of Indiana. President Trump tweeted that he had asked Mr Pence to leave if players kneeled and said he was "proud of him". The president has continued to stay involved in the issue - praising Dallas Cowboys owner Jerry Jones, who threatened to leave out players who did not stand during the anthem. ESPN commentator Jemele Hill called for advertisers to boycott the Cowboys as a result of Mr Jones comments and has been suspended by the network for two weeks for a "violation of social media guidelines". Mr Trump passed comment on the decision, saying that ESPN's ratings were falling as a result of employing Ms Hill. The protests have also been seen outside the US with some players at two NFL games staged at Wembley Stadium in successive weeks "taking the knee" when the Star-Spangled Banner was played. Players who stand are actually breaching etiquette but not breaking the law. The Flag Code, which was drawn up in 1923, covers all aspects of etiquette in relation to the Stars and Stripes, including how to behave when the anthem is played. The code is never enforced, however, and there is no punishment for breaching it. The code states that people are expected to stand and face the flag, if there is one. Civilians should stand to attention with their right hand over their heart, while military personnel in uniform and veterans should salute throughout. A recent amendment to the code said that military personnel out of uniform could also salute.